We Become Familiar, But We’re Still Odd | Sprezzatura, Y'all! We have just over five weeks left here in Italy. I remember our first day here so well. We were so eager to explore, meet people, fit into the community and learn about the food and culture that we jumped right into the fabric of the society here. We came here with an energetic enthusiasm that colored everything we did. Now we look at the calendar and see that our time here is almost over. And we’re a little stunned. It seemed as if it would go on forever, this blissful, idyllic lifestyle of adventure. Time is such a slippery thing – it seems like we just got here, but also like we’ve been here forever. Peeling back the layers on the people we meet here is fascinating. Because of the language barrier, we get to know people slowly and usually have tentative starts. But we’ve been here long enough that we’re starting to become familiar. And because it’s a small town, everyone knows about us – the Americans who are here for six months with their dog. One evening when I was walking home I passed one of our older neighbors, Maria. She was with a group of her friends. I spoke to her and she spoke to me and I walked on. Behind me I heard their hushed voices asking her who I was and her quiet reply. I smiled and thought to myself, I’m the exotic stranger in town. Don’t think that’s ever happened. It’s a small town and we’re conspicuous. People remember us. They’re curious about us. We don’t blend in – as much as we’d like to. Our neighbors really try to make us feel at home. They let us know about all the events going on and give us information about the area. Just the other day, our older neighbor gave us a book on Anghiari in English. I don’t know where he found it, but it’s a great book about the history of Anghiari and the area. He said we needed to know about our country. I couldn’t agree more. What a beautiful gesture. We’ve also changed our names. Steve and Cathy just don’t make sense here. Steve is much easier than Cathy, but it still is not something Italians are familiar with. Italians don’t know the “th” sound in Cathy and it’s very foreign to them. So we’ve become Stefano and Caterina. One of our neighbors, Jonpietro calls Steve “Stef”, which is, I guess, like Steve is to Stephen in English. Jonpietro is the one who arranged for Steve to play St. Peter in the Christmas processional. He also gave us a Christmas present of various treats from the local bakery. He takes such an interest in us and makes sure we know about things, even though he speaks absolutely no English. On Christmas Eve when he was giving us our gift, he asked us how to say something in English – the first time he’s ever asked. I took that as a good sign – maybe he doesn’t want to learn English, but at least now he’s curious about it. It endeared him to us even more. 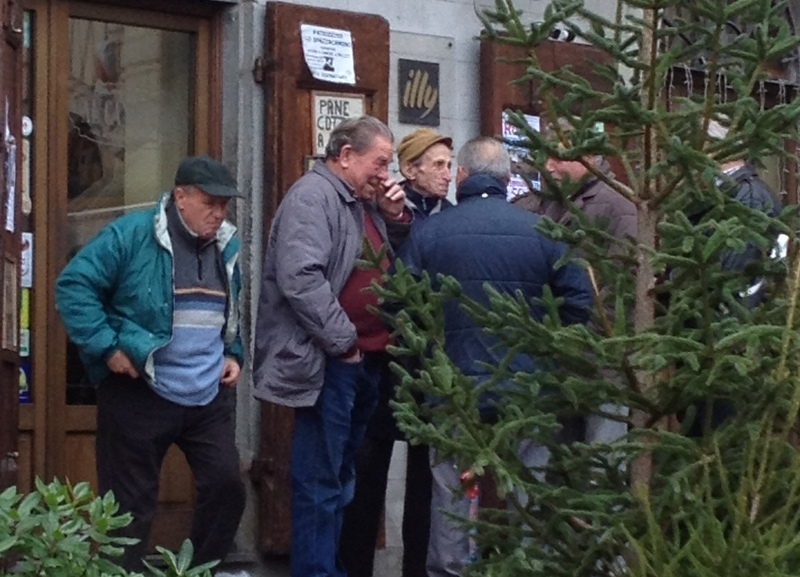 In Anghiari, which is typical of Italy, the retired men are out all the time. They’re in the piazza, they’re at events, they’re walking around at night, they’re everywhere. Their wives are at home. You see the wives going to the markets and doing their shopping in the mornings, and they’ll stop and gather, gossip a little and catch up, but other than that, you rarely see them. Except for when they peer out of the windows. The men are in the piazzas, the women are in the windows. I’ve tried to figure out why this is. Why don’t the older women come out and congregate throughout the day and evening like the older men? I think it’s because they didn’t retire. The men quit working and had to have something to do, so they get together with other men who have nothing to do and chat it up. The women’s lives didn’t change when the men retired. There was still just as many meals to cook, laundry to do, rooms to clean as before. So life goes on for them with no change. Only now their husband is home more than when he went to work every day. Maybe they shoo them out of the house and that’s why they congregate in the piazzas – they’ve all been kicked out of home. Our neighbor Maria is an exception. We see her out a lot. She is in the neighborhood, in the piazza, in other towns around here. I don’t know her story, although I hope to before I leave. There’s no evidence of a husband or children in her life, so maybe she was one of the ones who didn’t marry, or lost her husband, and had to make it on her own. Whatever the reason, she’s out there – chopping wood, watering plants, having caffe in the piazza with friends. I don’t think she spends a lot of time tending house, although I do see her peering out of her window quite a bit. But only when I’m peering out of mine. We live above a restaurant, the Cantina del Granduca. It’s a great restaurant and we eat down there quite often. It’s run by Cristina and her two children, Mattia and Veronica. Mattia just started college this fall in Siena. He spends the weekdays there and comes back here every weekend to help at the restaurant. His sister, Veronica, is the chef. Their mother, Cristina, does a little bit of everything – including cooking. But Veronica is in the kitchen everyday. Mattia speaks pretty good English, Veronica speaks a little, and Cristina speaks almost none. So we’ve talked to Mattia more than anyone else. Besides, when he’s there he’s waiting on tables, so we have more of an opportunity to talk to him. Mattia thinks the U.S. is the greatest place on the planet. He’s never been there, but would give anything to go. He almost reminds me of an immigrant around the turn of the 20th century who thought the streets there were paved with gold. When we asked him what about America intrigued him so, he said he thinks everyone is treated equally. I’m sure there’s more to it than this, but that was his answer. And, in theory, that’s true. Although we all know that often it’s not always that way. He would trade places with us in a second. And we probably would with him, too, if it were practical. His sister, Veronica, has a great talent as a chef. And when she says her name, it’s in a throaty whisper that lingers on the “ron” with her rolling r’s that makes even straight women stare at her open-mouthed. Her food is wonderful in that classic Italian way – very simple but incredibly flavorful. For those of you who have looked up the name of my blog, sprezzatura, that’s what her food is. Studied nonchalance. She takes fresh, simple, seasonal ingredients and turns them into a symphony for your taste buds. And makes it look easy. Sprezzatura. Across the street from us is a wonderful little boutique, Elisabetta. Elisabetta and her husband live in Florence, or in Le Ville, or both. We can’t quite figure it out. 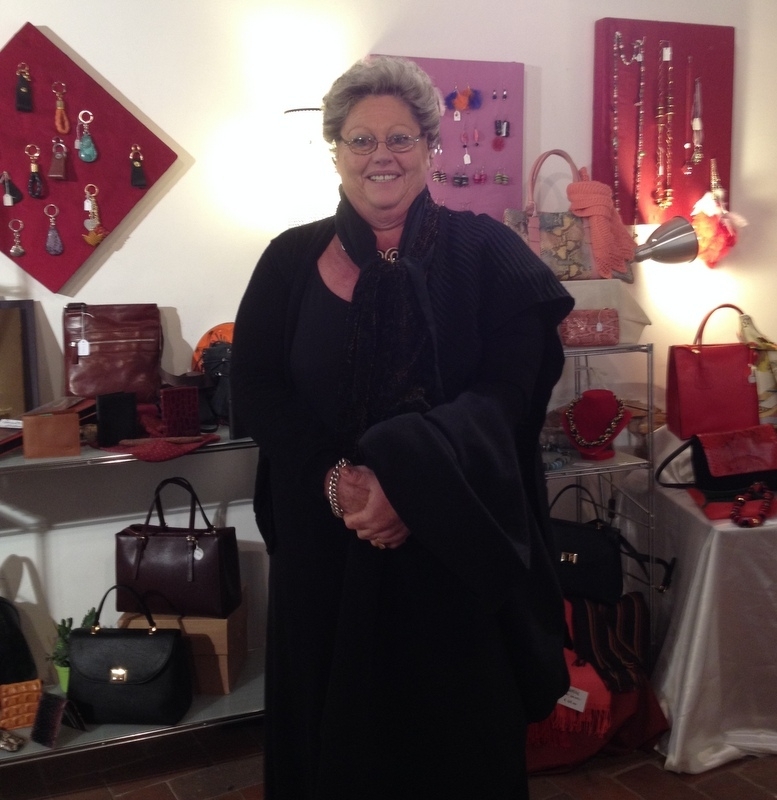 Regardless, they design and make leather products – purses, wallets, etc. They are beautiful and high quality and very affordable. Myra, Edith and I have all bought purses from her. Elisabetta has a booming voice and a broad smile and we always know when she’s opening up because we hear her calling greetings to everyone on the street. She speaks a little English and is very curious about us. She has a huge heart, you can just tell, and seems to always be happy. She’s open every single day, even when some of the other shops are closed. And she wears sandals, even when it’s cold out. Being here as long as have, we’ve had to get our hair cut. 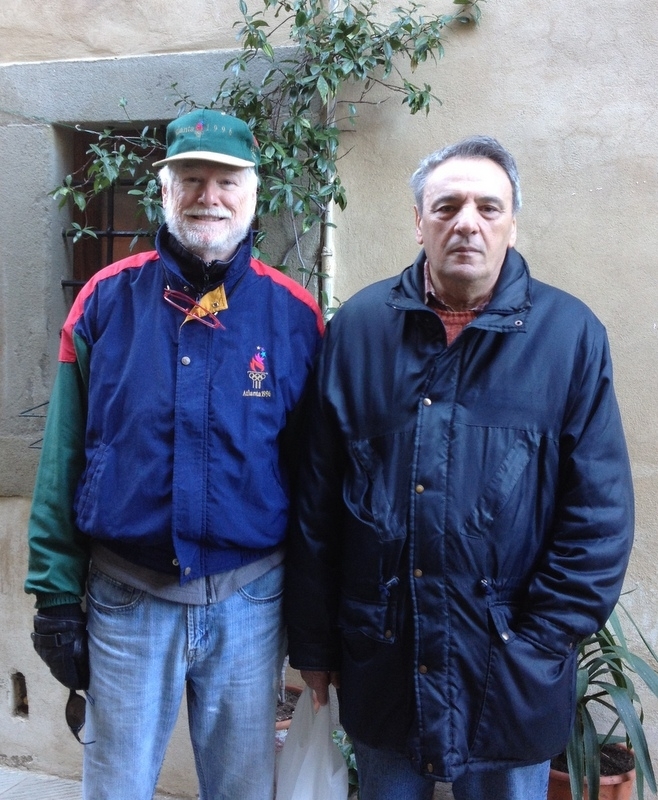 Steve was first and he went with an English speaking friend who helped translate. The barber said his hair looked like it had been cut by a dog, but he would make it better. I asked Paola, Giovanni’s wife, where to go. She gave me the place she uses and I went in there to make an appointment. There are two hairdressers there and one speaks a tiny bit of English. I got the one who doesn’t speak any English. We sign languaged our way through what I wanted and she set out clipping. There were about eight other customers in there, all older women, all getting their hair dyed. I was quite the curiosity to them. In fact, I had to wait on her to finish up with a customer before she could take me. When my turn came, the woman she had just finished stood beside the chair while my hair was cut and styled, holding her purse over her arm with her coat on. The second I nodded my approval, she left. I know I must be unusual to them, but my hair is pretty regular. First time I’ve ever had an audience for a haircut. These people have gone out of their way to make us feel part of the community. It makes us feel like a part of this place. They’re also very curious about why we’re here. Our language skills are not nearly good enough to tell them why. It’s really painful not being able to speak to these people. We usually get the general subject of what they’re saying, but the details remain elusive. So after all this time, we’ve decided to take Italian lessons. When we came here, we thought the language would flow over us and we would just drown in it. Well, we’re drowning alright. But in a gasping for air kind of way. We met Antonio, our new Italian teacher, at the library at the weekly Tandem meeting. That’s where Italians and English speakers come and try to learn each others’ language. It’s fun and helpful, but it’s not getting us where we need to be. 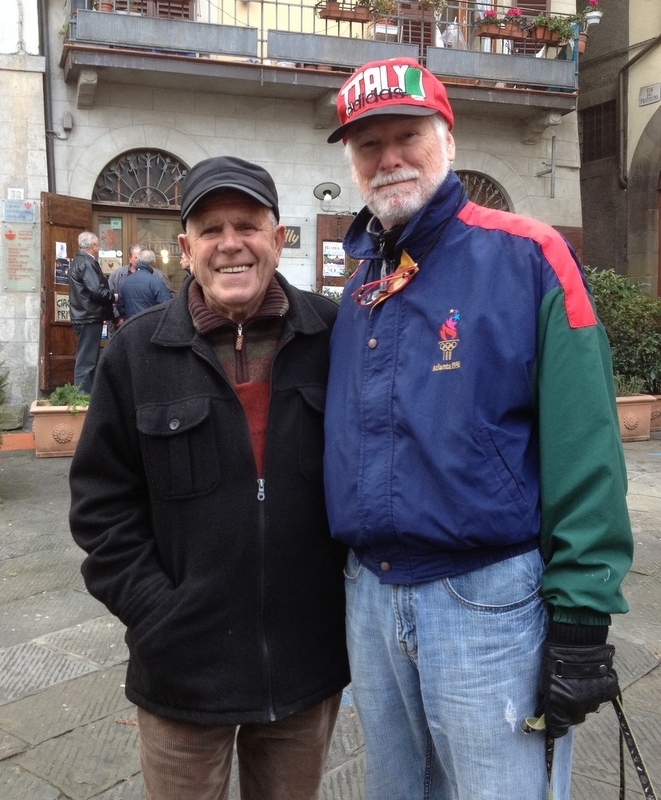 We have met some wonderful people there and we see them around town all the time. 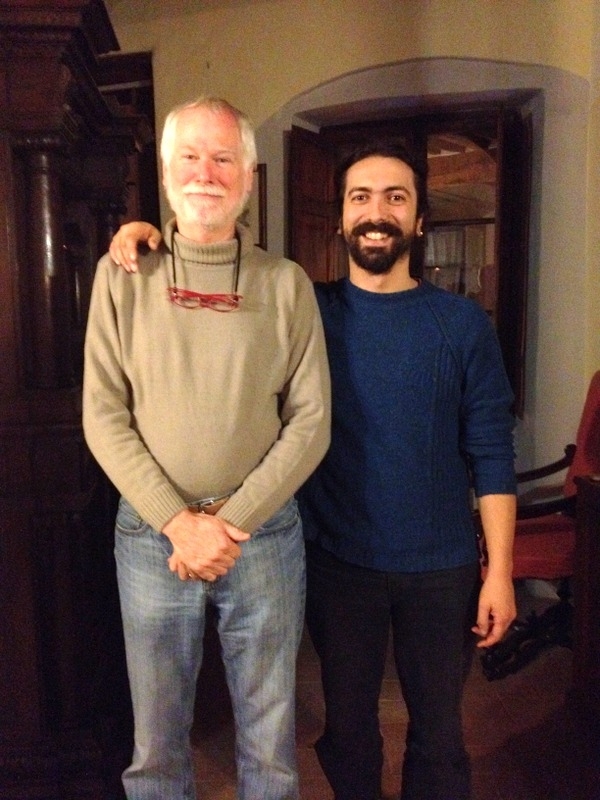 Antonio teaches Italian as a second language to American university students. So we figured he could handle us. He comes to our apartment once or twice a week and he has really helped us. He also gives us homework, which we’re kind of slack on doing. Antonio is a linguist of sorts. I’m not exactly sure what his specialty is, but he knows the Italian language inside and out. Also Latin. Tim, if you’re reading this, he took one look at the inscription in our living room and translated it immediately. Basically, it’s the Golden Rule – Do to others as you would have done to you. There’s no wolf involved (inside joke). He thinks it’s not Latin or Italian, but something from the 19th century. Earlier and it would have been Latin, later and it would have been Italian. We love him and we would like to dump his brain into ours. But we can’t, so we’ll keep schlogging through our once or twice weekly lessons. He assures us it will click if we practice enough. We hope he’s right. This entire town is full of characters and wonderful people. Just like any town. The old man who shuffles around town wearing a sailor hat and sits up with the altar boys during church. The distinguished gentleman who dresses very snappy and has a mysterious air about him – rumor has it he made a lot of money as a poker player. The barber who wears a toupee. The butcher who sings as he cuts your meat. So many more who we don’t know, but who always smile and greet us and have welcomed us into this community. So we’re familiar to them, but still very unusual. Americans and other English speakers live here and have stayed here for extended periods. I think they were all a little exotic in the beginning and maybe they still are. We are intrigued by what’s different from us. And it’s that curiosity which brought us here in the first place. To live in another culture, in another environment, is fascinating to me. Granted, living in Tuscany is not in the same category with Margaret Mead or Dian Fossey, but it makes you step outside what you know and trust and see things from a different perspective. And, to me, that’s the reason to travel. Get your hair cut in a foreign country sometime and see what happens. 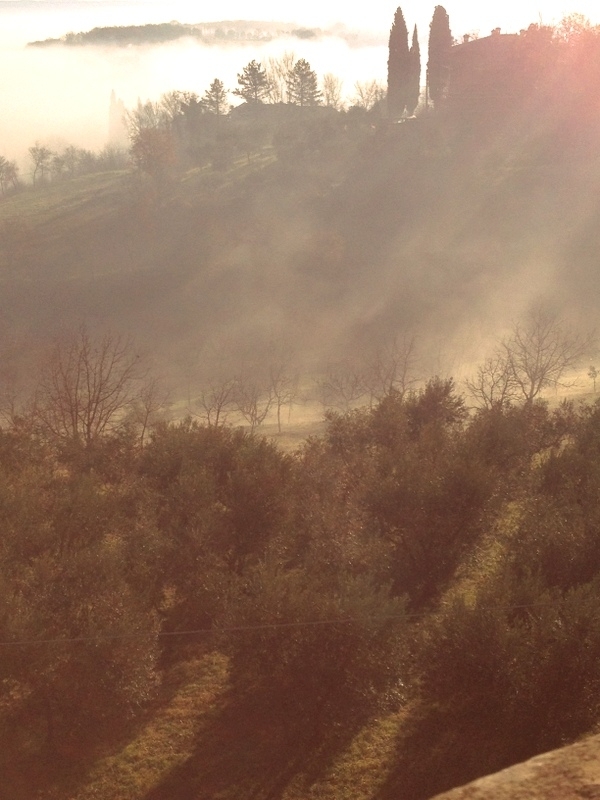 Bella description of your little village, Caterina!! Every day has to be an adventure!It’s so nice that ya’ll have had such a wonderful experience! Pushing yourselves beyond what you know as your comfort zone has been such a reward for you both! As you describe- it is life! When we can look beyond ourselves we find true treasures, and in return we share that new part of ourselves with all. Heres alla vita!